The all-aluminum coil found in this Trane air handler is exponentially more durable than standard copper coils, which are susceptible to formicary corrosion. This ensures families stay comfortable indoors all year long, no matter what the weather outside. 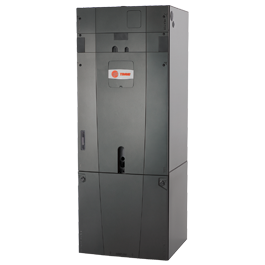 Thanks to the exclusive Trane Vortica™ blower, the new Hyperion™ XR residential air handler provides homeowners with reliable, ultra-quiet operation, so they can hear each other instead of the heating and cooling system.